I was reminiscing about THIS retro fringe umbrella I made last summer and decided I wanted to make something that was inspired by the iconic beach cabanas for this summer. Since there are so many weddings, parties, and birthdays to be celebrated during the summer months, I thought the timing was just right for them. 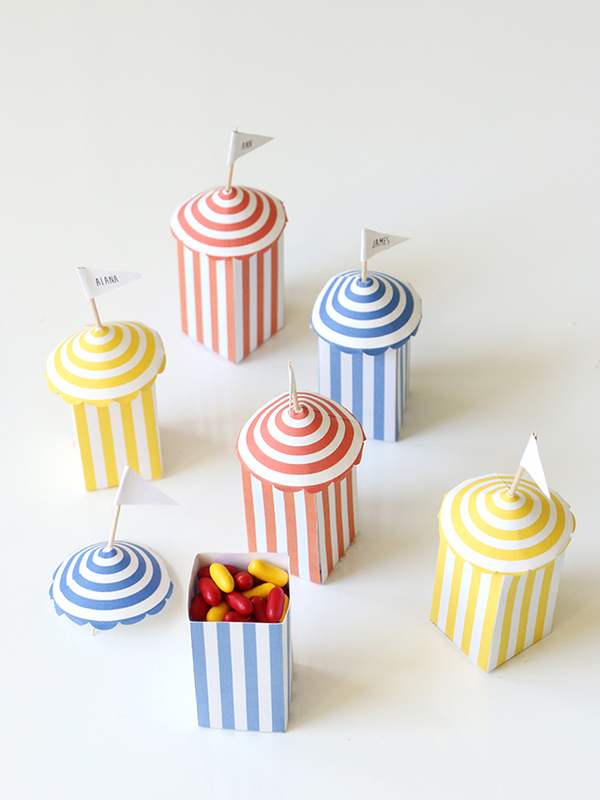 Not only do they work as place settings, but these little cabanas can also be filled with candy, making them perfect party gifts. Best of all, these were made with Avery labels which means you can customize and personalize them as you wish! Continue on below for the directions and the downloadable (and customizable!) template. Step #1: If you wish to follow along with the same classic primary-color cabanas I went with, print THIS PDF for the bottom box portion of the cabanas on white card stock. 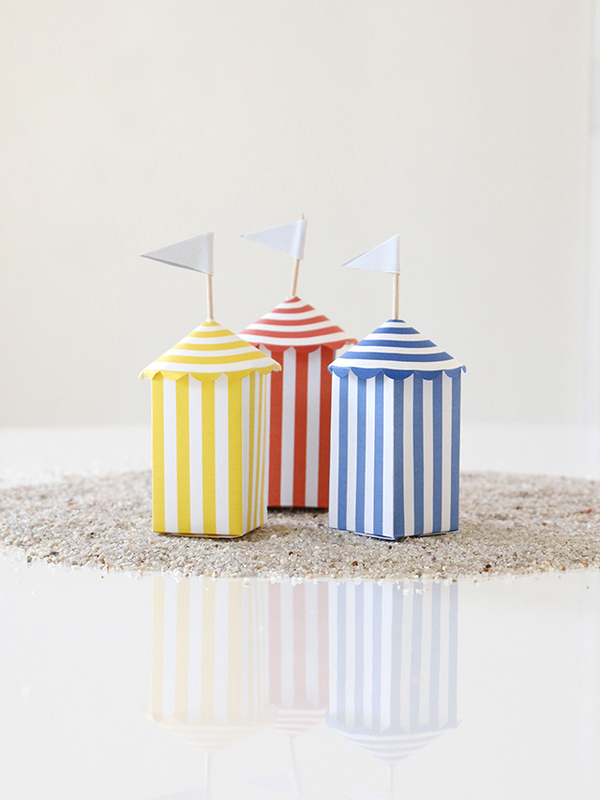 For each box, you’ll want to cut your desired color of striped paper to 5-inches wide and 3.5-inches tall (with vertical lines). If you don’t want to go with my color scheme, just use the color or patterned paper of your choice, cut to the same size. Step #2: Once cut, fold the paper in half twice to get 4 even sections. Make sure to score each line well, so that you have defined lines in your paper. Step #3: Lay the paper down with backside facing up and fold the striped side over 1-inch. Again, score the crease to get a defined line. Step #4: Unfold the section, flip the paper over and make three x 1-inch cuts at each crease in the bottom section of your paper. This will make four flaps, each 1-inch long. Step #5: To make the box fold the bottom flaps over each other and use a piece of clear tape to secure the pieces together. Position a second piece of clear tape on the two sides of the box that are open. To achieve a cleaner look, tape from the inside of the box. 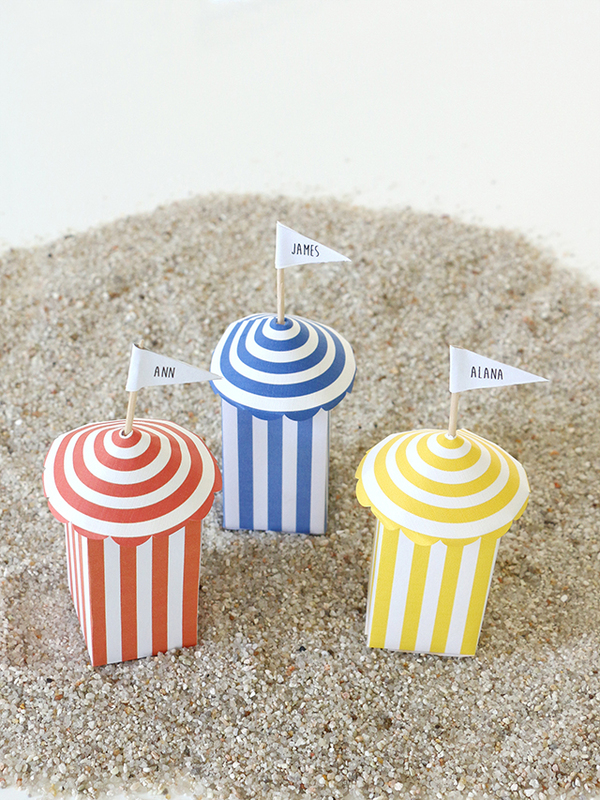 Step #6: Next, print out your Avery #8218 labels for the tops of the cabanas using the PDF version HERE. If you’d like to customize my design (change the colors, resize, etc.) OR if you want to make your own design, download the Avery version HERE. To open the .avery file provided go to avery.com/print, open the saved file (select “Open a Saved Project from: Your Computer”), and the design will automatically open in Avery Design & Print Online. You’ll be able to customize and personalize the design to make it best for you. 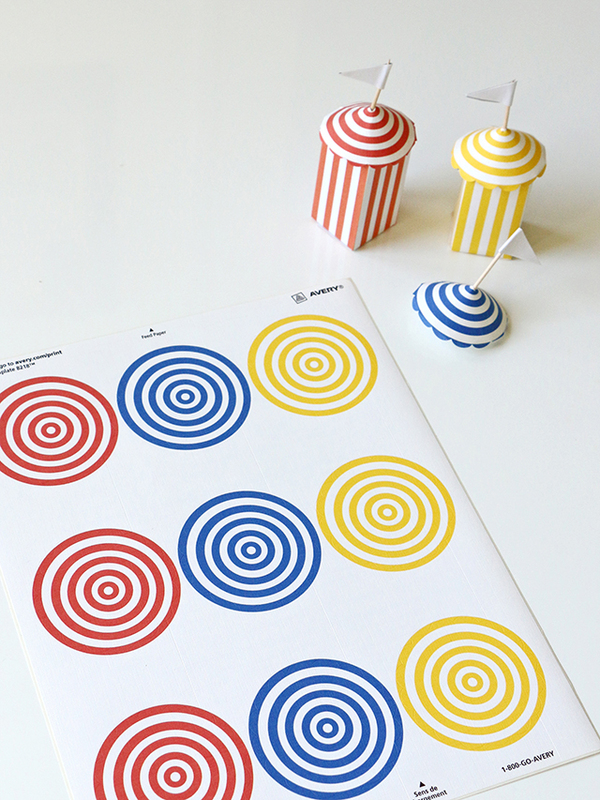 You can change the colors, the pattern, or even add text to your umbrella. Once printed, remove one of your labels and cut out one (pie-shaped) scallop section. Step #7: Overlap one edge of the label over the opposite edge to achieve an umbrella shape. Step #8: Turn the umbrella-shaped label over and insert a toothpick up into the center. 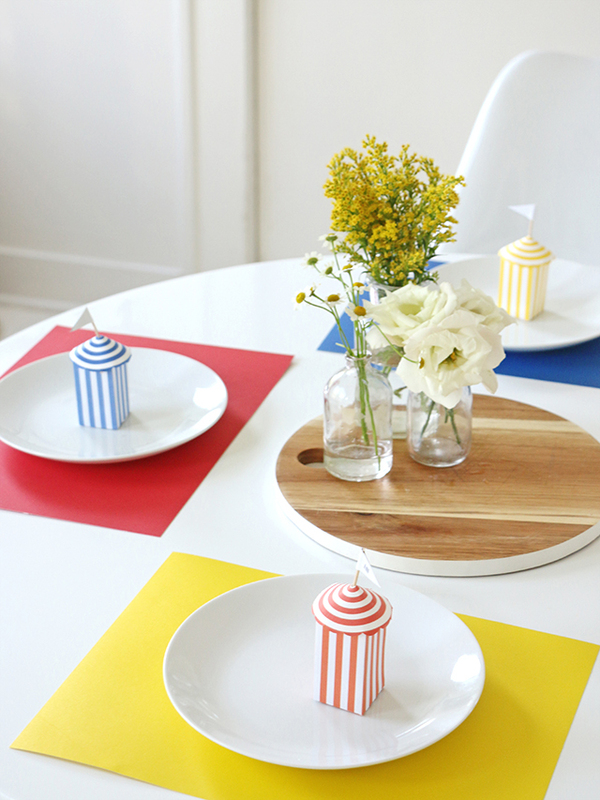 Using leftover adhesive paper from your label sheet, cut out a small flag shape. 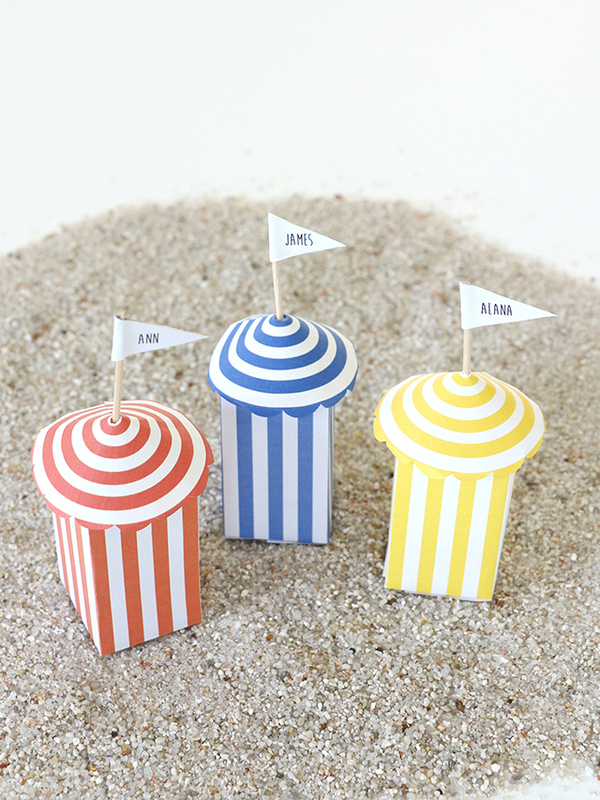 Use a pen or marker to personalize the flag and position it atop your toothpick. 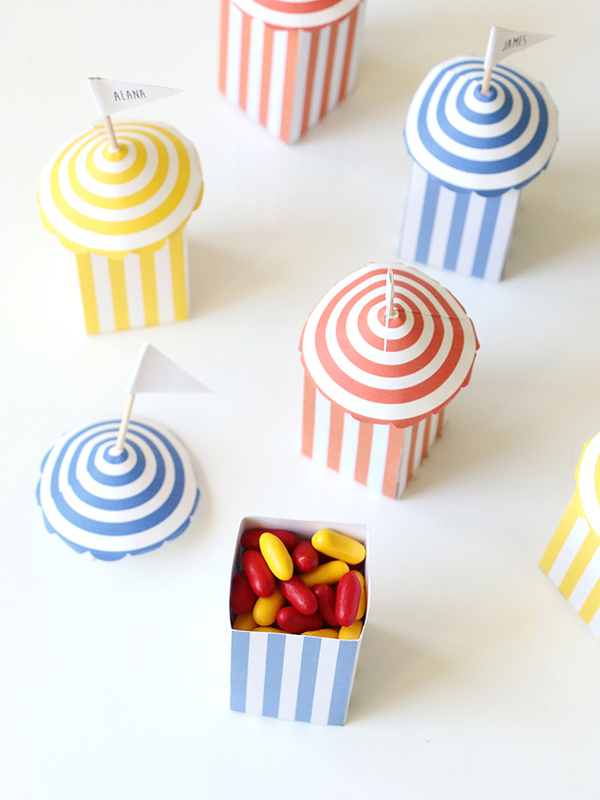 Step #9: If you’d like to fill your cabana place card with candy, do so now. Step #10: Lastly, position the top of your umbrella onto the cabana box. 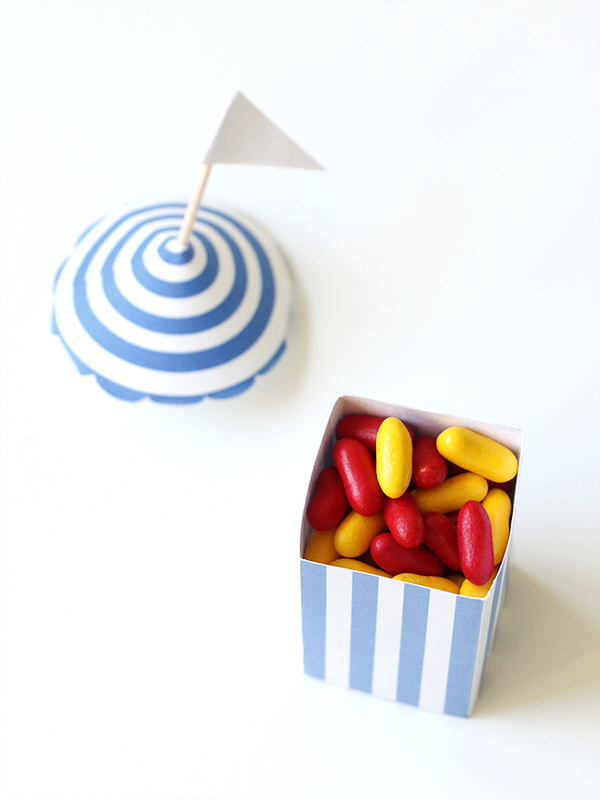 The sticky label shouldn’t require any additional glue, but if you’d like to permanently close the box (and not use it as a candy-filled favor), add glue around the top edge of the box before placing on the umbrella. Once your umbrella top is added on, gently fold over the scalloped edges to complete the look. 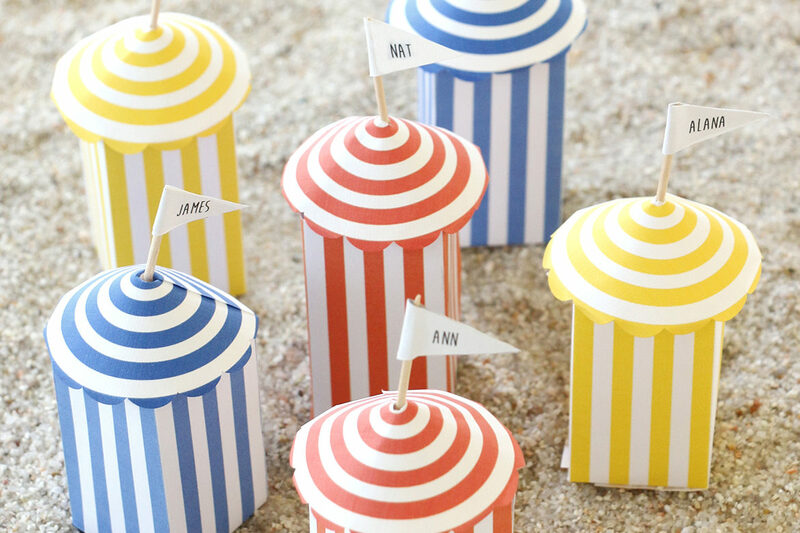 Here’s one last big DIY tip…if the cabanas aren’t really your thing, by using just the Avery labels you can make umbrellas with only a toothpick. 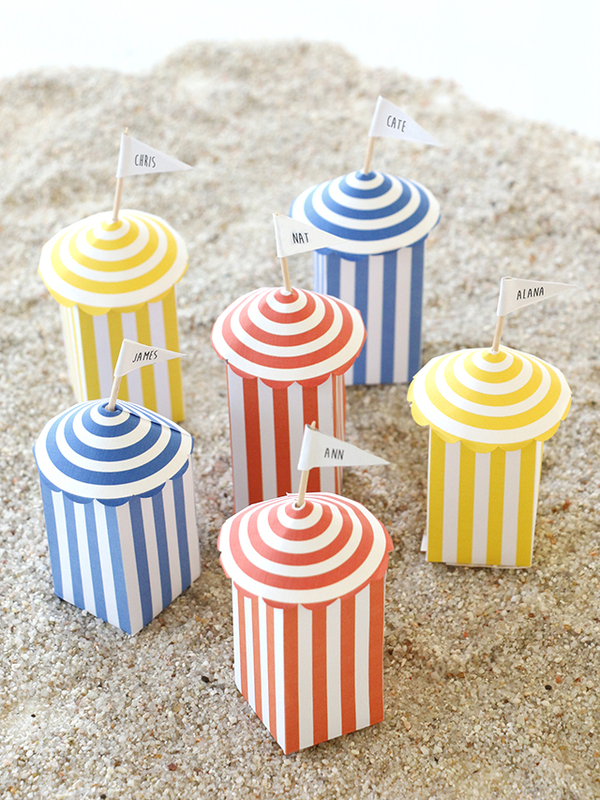 Or you can turn the label into a summery party straw! To do so, use a hole punch to punch out a hole in the center of the label, then make them into an umbrella shape by following steps #6 and #7 above, and then just wrap around a straw! I love the customization that is possible with Avery products, which is why I was thrilled when they asked me to partner with them for a handful of posts over the course of 2016. 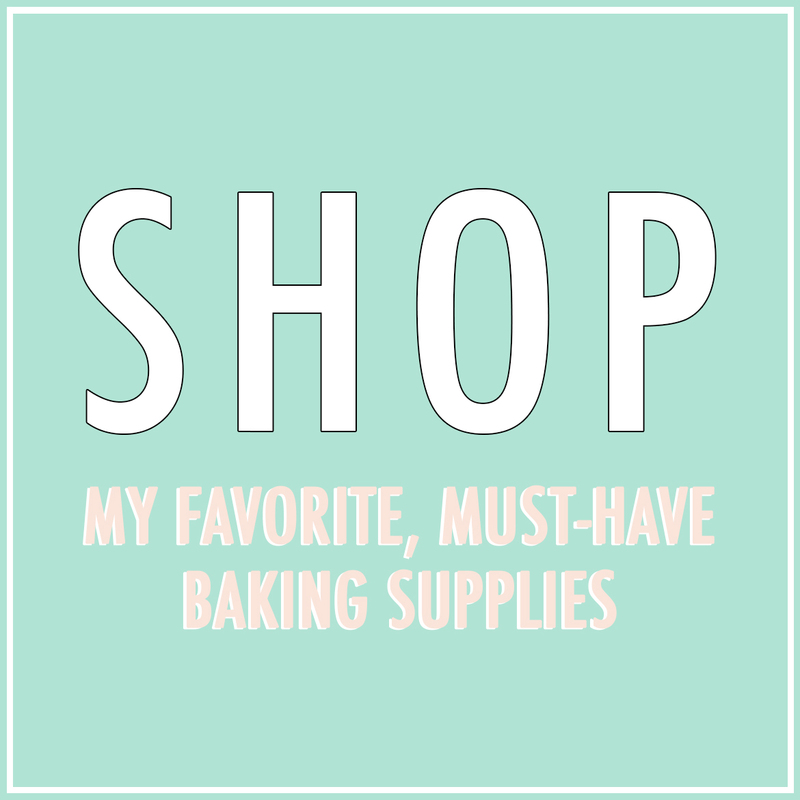 You can see some of my previous Avery-related posts including my DIY Gift Box Cakes and DIY Gemstone Soaps over HERE.